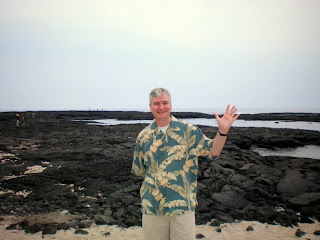 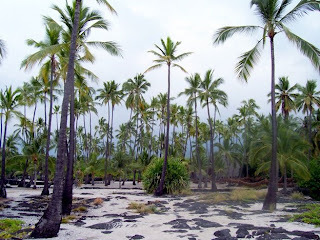 One day on our vacation to the "Big Island" of Hawaii, we drove around the entire island. 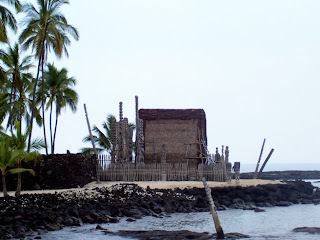 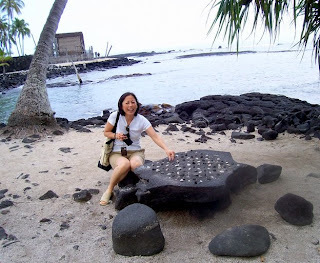 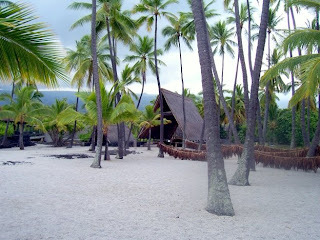 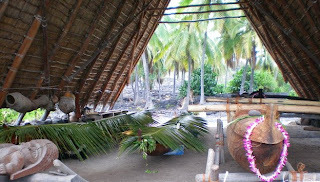 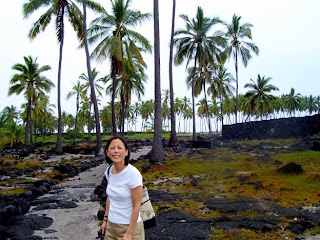 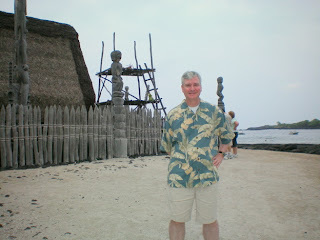 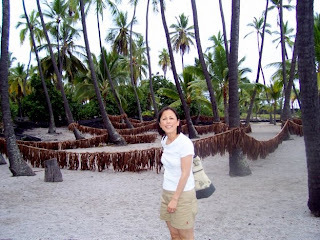 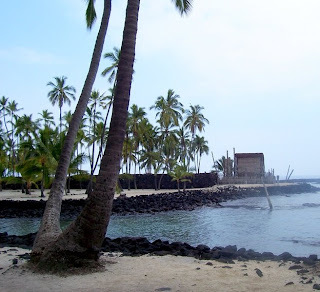 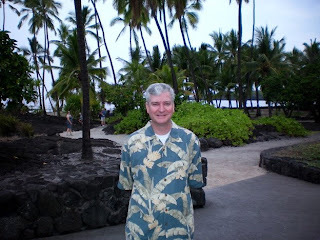 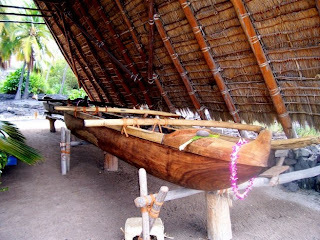 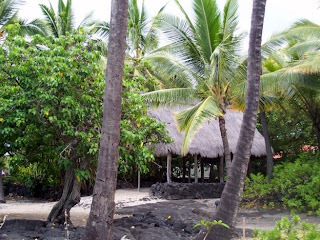 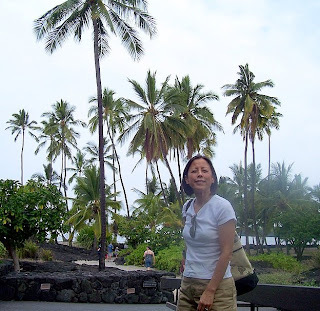 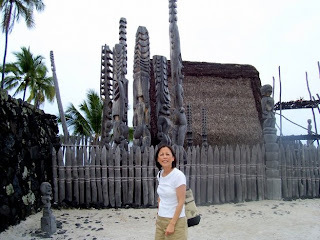 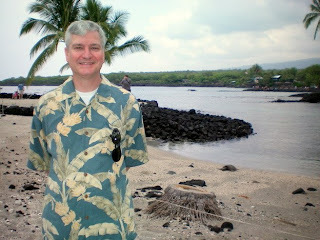 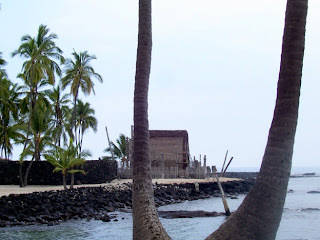 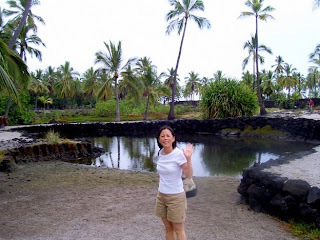 One of our stops on the drive was to the Pu'uhonua o Honaunau National Historical Park. 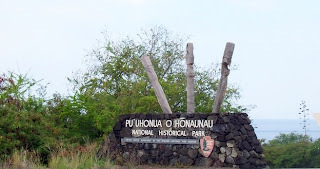 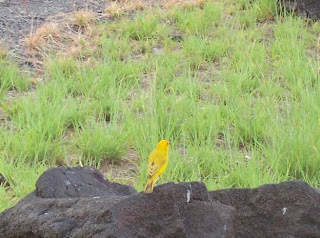 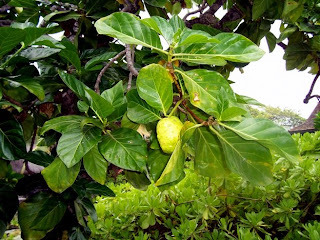 This park preserves the traditional Hawaiian life. 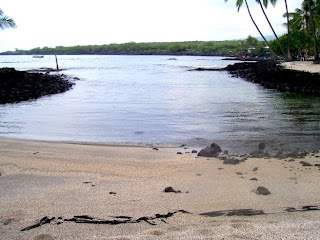 Honaunau Bay, with the sheltered canoe landing and the availability of drinking water, was a natural place for the Ali'i (royal chiefs) to establish one of their most important residences. 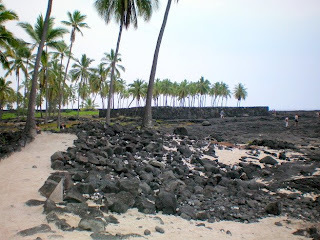 Separated from the royal grounds by a massive wall was the Pu'uhonua, a place of refuge for defeated warriors, noncombatants in time of war, and those who violated the kapu (sacred laws). 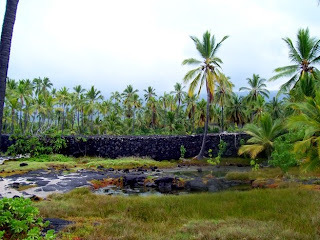 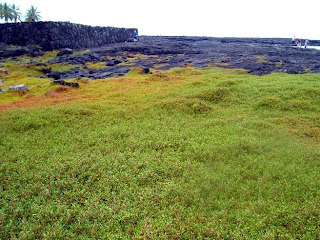 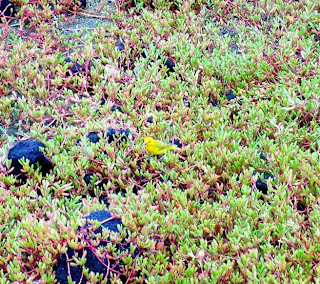 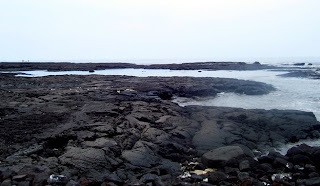 Heleipalala - A pond with a mixture of spring water and saltwater held food fish to be eaten by the ali'i. 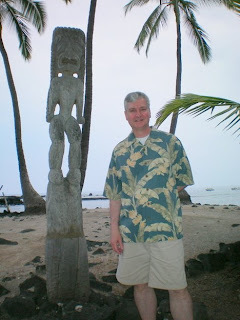 I'm next to a Tiki (or Ki'i) carving used to mark the boundaries of sacred or significant sites. 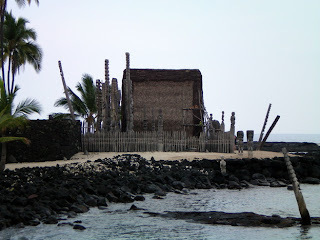 Hale o Keawe - Temple and mausoleum that held the bones of 23 ali'i. 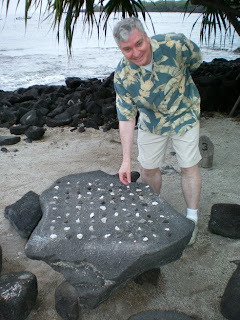 Konane - Pebbles for this traditional Hawaiian game are arranged on a replica papamu, or stone playing surface. 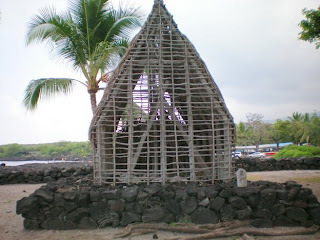 Temple model - The framework for this half-size reconstruction of the Hale o Keawe temple is oho'a wood tied with coconut fiber. 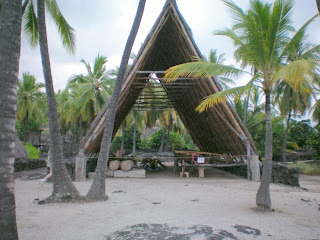 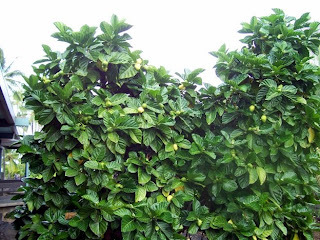 Ti leaves were tied on as thatching. 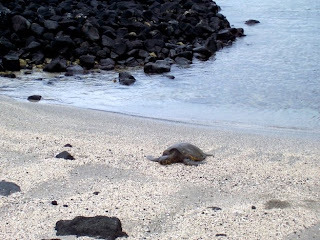 Catherine and I wanted to see a green sea turtle (or Honu in Hawaiian) while were in Hawaii and we saw this turtle on the beach and a couple of other swimming around nearby. 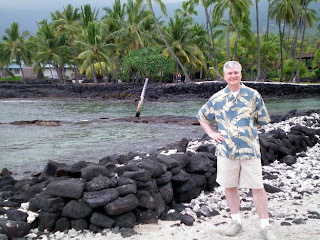 There is a turtle on the beach behind me in this photo. 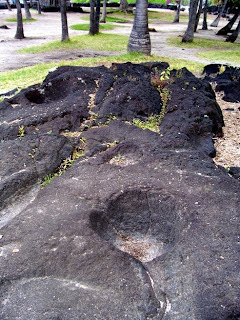 Bowls carved into the rock may have been used to hold dye, evaporate ocean water to make salt, or pound the 'awa root to prepare a ceremonial drink. 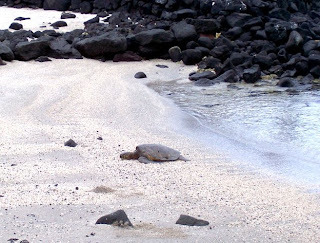 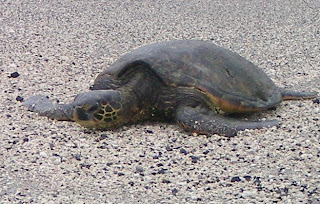 Another view of Honu, the Hawaiian Sea Turtle. 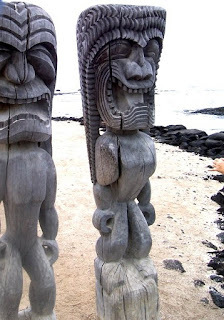 A closer view of the Tiki.